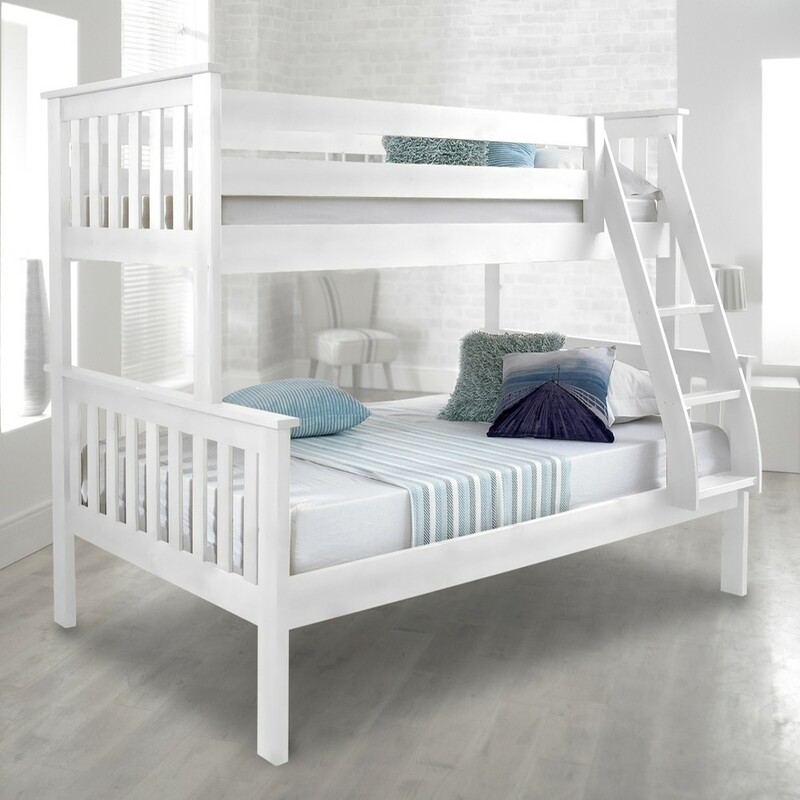 The Atlantis Triple Sleeper is a modern bunk bed manufactured using quality pine wood with a beautiful white lacquered finish which helps retain the fine qualities of the pinewood. There are 4 guard rails to the top bunk, 2 to either side which ensures safety for the top bunk sleeper. The ladder is adjustable to either the left or right hand side, designed to suit any bedroom requirements. The headboard and footboard are both styled with vertical slats. The bunk bed frame can easily be split and used as a separate 3ft Single and 4ft Small Double beds. Both mattresses are supported by strong wooden slatted base for extra comfort. It is a perfect option for saving space and it is ideal for both adults and children. The Atlantis Triple Sleeper is supplied flat packed for ease of delivery. The instructions provided are easy to follow and enables the easy assembly of the bed. Please be careful when moving the bed as it will be heavy. The shipping weight for the Atlantis Triple Sleeper is 73kg. Plus 24kg if you want two mattresses in a 3ft single size. To assemble the Atlantis Triple Bunk Bed, you will need a hammer, a posidriv screwdriver and a flat-head screwdriver. The Atlantis Triple Sleeper Bed has a maximum weight of 11 st (70 kg) on the top bunk and 17 st (108 kg) on the bottom bunk. Please could you tell me the exact sizes of mattresses required in centimetres for the top and bottom bunks? The Atlantis White Triple Sleeper has a single mattress top bunk and a small double bottom. This is UK sizes, so 3' and 4' by 6'3. The exact cm measurements cm are 190 x 91 for the 3' and the 4' is 190 x 121.92. What’s the maximum depth of mattress for the top bunk? The mattress is not included in the Atlantis but are available at checkout. Buying a mattress with a bed gives you a 10% discount on said mattress. Unfortunately, as the triple sleeper has supports in the middle of the double bunk, a trundle would not fit in the Atlantis Triple Sleeper. What is the measurement between the bottom bunk and top bunk as there is a lot of reviews that say there is not alot of space?